Have you been enjoying the 2015 MLB season? We’ve already seen no-hitters, gravity-defying catches, and home runs that would make Mickey Mantle tip his cap. Rather than rhapsodize on what has been an exceptional first half, we’ll just cue up five of the greatest moments of the season for your viewing pleasure. 1. Josh Donaldson’s “perfect” catch (June 24). In the video of this amazing catch, you see Josh Donaldson actually leap over a small child on the way to one of the greatest grabs in memory. Now check out the score. Tied 0-0 in the eighth inning, Toronto’s Marco Estrada had a perfect game going when Donaldson went the extra mile for that out. You just have to recognize an all-world grab that keeps a perfecto going. Before San Francisco’s Chris Heston threw his no-hitter on June 9, the rookie had 12 big-league starts to his name. In addition to the zero hits, Heston didn’t walk a batter. The only thing standing between him and perfection were three hit batsmen. He struck out 11 and guaranteed himself a place in the record books for his June 9 performance at Citi Field. 3. Giancarlo Stanton’s home run goes 484 feet (June 23). If you check out ESPN’s Hit Tracker for the 2015 season, you see Giancarlo locking three of the top five spots for home run distance this year. Naturally, he’s hit two bombs measured at 484 feet, the longest of the season. Since the first one went out at Coors Field, we chose the second meteor from June 23, this one going out at Marlins Park in Miami. Anyone who likes majestic home runs has to be a fan of Stanton. 4. 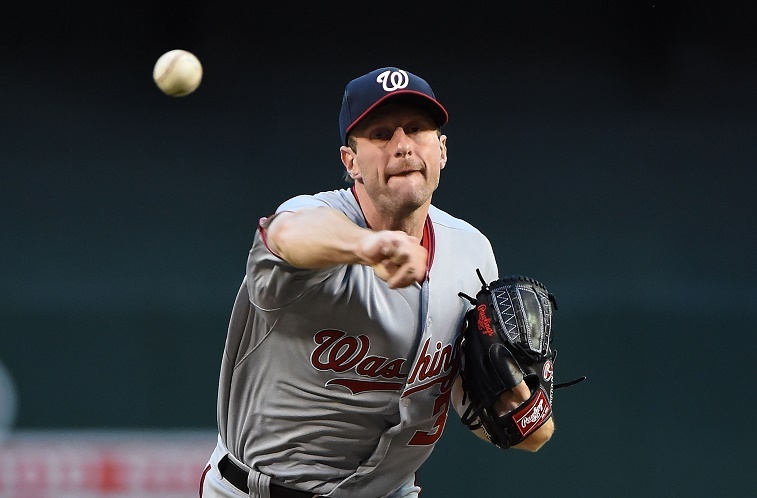 Max Scherzer is unhittable in back-to-back starts (June 14 and 20). Max Scherzer has already had a season for the ages, and his two starts in mid-June may have been the best back-to-back performances in MLB history. On June 14, Scherzer decimated the Brewers lineup, striking out 16 and ending up with complete-game, one-hit shutout. (He had a perfect game into the seventh inning.) As an encore, he took a perfect game against the Pirates into the ninth inning, when he clipped the arm of Jose Tabata. He settled for a no-hitter, just one hit batter away from perfection. 5. Nolan Arenado’s catch of the year (April 15).